Embarking on a new IT project is a major undertaking no matter what your company's scope or size, but when you're News Corp -- with 10 business units and 25,000 employees around the globe -- it's not for the faint of heart. That, however, was exactly the challenge that faced Dominic Shine less than a year after he joined the media conglomerate as global CIO. Spurred by the company's split from 21st Century Fox back in 2013, Shine helped create a brand-new global enterprise IT strategy to take the newly reborn News Corp into the future. With 25,000 employees to support in 10 major business units covering diverse industries such as news, book publishing, marketing, real estate and education, Shine started by ensuring that the new strategy was based on three simple pillars. First, the new IT plan would support continued acceleration of digital growth and revenues; second, it would modernize internal platforms and tools to enable cultural change, increase collaboration, and make employees more effective, productive and engaged; and finally, it would consolidate News Corp's infrastructure and operations to free up funds for its digital transformation while also improving responsiveness, agility and scalability. "Our 10 businesses were pretty much each paddling their own canoes up to that point," Shine said. "They each had their own technology strategies." At the time, News Corp operated more than 50 data centers. Email was handled by on-premises platforms like Microsoft Exchange, and much of the company's enterprise software was "monolithic" and unreliable, Shine said. Among the initial goals for the new IT transformation: to get 75 percent of News Corp's computing power onto the cloud within three years, to consolidate its 50 data centers down to six, and to achieve $100 million in savings over three years. Now just two years in, that savings objective has already been met. The company has brought roughly 50 percent of its computing power onto the cloud -- leaving just 25 percent still to go -- and more than 20 data centers have been closed. Along the way, the majority of on-premises email has been replaced by Google Apps. Old platforms such as PeopleSoft have given way to Software as a Service (SaaS) cloud apps from companies such as Workday that "give us a lot more flexibility," Shine said. Salesforce.com has replaced numerous legacy apps, and Amazon Web Services (AWS) has largely answered News Corp's public cloud needs. New Relic, meanwhile, helps with performance measurement and management. Dropbox for Business is the tool the company has chosen for collaboration enterprisewide as well as with partners. 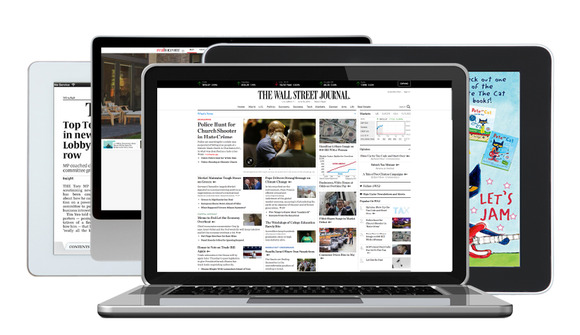 News Corp brand The Wall Street Journal, for instance, uses the cloud software as a hub for collaboration around the increasing number of videos submitted by its journalists, Shine said. Single Sign On (SSO) technology from Okta helps improve experience and security. There's still more to be done toward News Corp's overall goals, but in all its efforts, Shine stresses the importance of collaboration and a good understanding of company culture. "I have personally witnessed or suffered at the hands of transformation across large organizations," he said. With that experience in mind, Shine ensured that News Corp's new strategy was co-created in a collaborative fashion with the technology leaders across all 10 of its businesses. "We wanted to take the best ideas from across the group," he said. New Relic, for instance, was a technology several of the business units had already used. "That was an example of where we were able to say, let's cross-fertilize," Shine said. "News Corp can then make a commercial arrangement with New Relic, with better terms for everyone." Implementation has been conducted with strong business involvement and regional coordination, including very clear targets for measurement and performance. "Ultimately, we want to measure the success of this through customer satisfaction," he explained. "The way we want to initially measure how we roll it out is to identify all the customer-facing services and track rollout progress on a monthly basis." Monthly reports for CTOs and senior management ensure that everyone can see not only progress towards goals but also upcoming challenges. "People can see where they might be able to learn something or where they might be able to provide help to another business unit," Shine said. The approach has worked well, but that doesn't mean it hasn't had its share of challenges. "Initially, this was a very different way of working," Shine said. "Even taking a very collaborative approach and co-creating the strategy, it was still very different for people who had been pursuing their own strategies up until that point." Change management was in many ways the biggest challenge, including "patiently and politely discussing the plan with senior management to get them on board," he said. The early emergence of financial savings, of course, was an added boost toward that end. Shine's advice for other CIOs facing similar projects? "The first thing to focus on is the culture of your organization and really understand that," he said. "It's very different doing transformation in a very globalized organization -- the way you go about this is more important than anything else." It's critical to plan transformations to complement culture rather than go "against the grain," he stressed. Also essential is to focus on the experience that people are going to have, whether they're users of a new app or senior managers looking at costs. "If you focus on their experience and benefits -- stay ruthlessly focused on that and make sure the solutions you choose are the best you can do for the money you have -- provided you have good execution partners, you can't go wrong," Shine said. Finally, Shine's third piece of advice is to choose technologies that not only offer a good experience but are also secure, open and scalable. "Having something that is a great point solution is a short-term strategy," he said. "Having something that is very open and that can connect to your other processes will take you a much longer way."